The White-Tailed Kite’s ability to hover or “kite” in the air gives is what gives this striking bird its name. It is also sometimes called the “Angel” hawk for its white feathers and the appearance of “floating” in the air. It is a delicate and graceful bird of prey, and the only falcon-like bird in California to have a white tail. It is about 15″ long with a 39″ wing span. 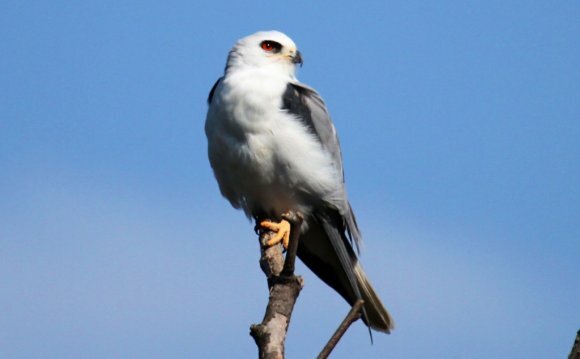 Falcon shaped, the White-Tailed Kite has long narrow wings and a long tail. It is gray above with white head, under parts, and tail. In flight, the under wing has dark gray outer feathers, with black patches on the forward part of the upper wing. The juvenile has a cinnamon color on its back, crown, and breast and a narrow dark band near tip of the light tail. The sexes are similar in appearance. All have red eyes. The White-Tailed Kite soars and glides like a gull, holding its wings with the tips downward like a gull. It has about an 80% hunting success rate. It feeds mostly on rodents, particularly voles, mice, insects, and lizards. It hovers while it searches for prey, rapidly flapping its wings, then plunges after its prey. It usually feeds at dusk and often dangles its feet while in flight. You might find it perched on the tips of branches; it likes to rest in high lookouts or vantage points like trees and telephone poles. The call of the Kite is a whistled “keep, keep, keep”. It is sociable bird outside of breeding season and will hang out in large groups near marshy areas. Kites are monogamous and form pairs in December. In January, they start to build their nest. The nest is a stick and twig platform lined with grass and leaves. It is placed in a tall tree near water and open country. . The female lays 4-5 eggs and incubates them for about 32-35 days. The male will bring food to the female while she incubates the eggs. He continues to bring food to her after the young hatch, which she uses to feed her chicks. The young fledge in about 35 days but are not able catch prey and feed themselves for about another month. The adults may have two broods a year.